BUT WHERE CAN WE EAT? We live in the south. In Atlanta to be exact. The land of everything FRIED. But over the years, we’ve found more and more places to eat gluten free in Atlanta. We have eaten at all of these restaurants and my picky eater will eat at these restaurants, so I can honestly say go here. 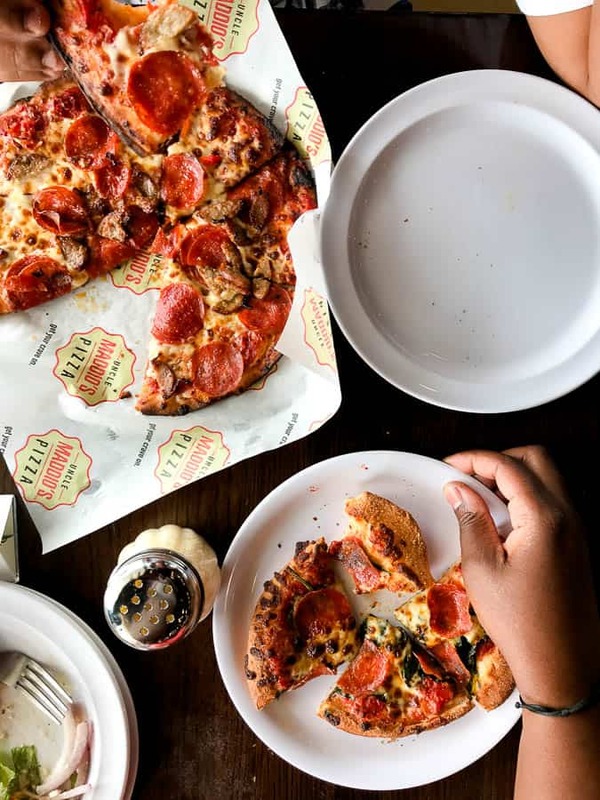 If you have been following this blog or me on Instagram for any amount of time, you know we LOVE Uncle Maddios Pizza. The gluten-free pizza crust here is wonderful, and they will add any topping you like. When I need baked goods, one of my go to places to go is Sally’s Gluten Free Bakery in Roswell. Cupcakes, fresh bread, pies, cakes….you name it, they have it. And the pecan pie during the holidays is glorious! I was so surprised when I learned that this Atlanta icon had a gluten-free menu! This landmark is all things southern and Atlanta. The gluten-free menu is extensive and will keep even the pickiest eater (read Pookah) satisfied. Bartaco has three locations in the Atlanta Area: Westside, Buckhead, and Inman Park. What is great about this place is that the majority of its taco and tamale menu is dedicated gluten free. The tacos are made with corn tortillas. All dishes with gluten on the menu have an * . Located in Virginia Highlands and the Westside, this great find that prides itself on local ingredients, organic produce, dairy products and grass-fed beef. So it makes total sense that they would have a great gluten-free menu. You can get anything from hamburgers( obviously) to hot dogs on a gluten-free bun. Looking for a great breakfast/brunch spot? We always are! Egg Harbor Cafe is the perfect spot to get gluten-free pancakes, cinnamon rolls, grits or sandwiches. And there is now a new location right on Peachtree. Located in Atlantic Station, I discovered this one by accident. But from Brunch offerings like the Almond pancakes to the Gluten Free Onions rings, this is a great little spot. And it has great outdoor space for people watching while you enjoy your food! If you live in Atlanta I’m sure you’ve had one of Ted’s famous Bison Burgers. You can get those Bison Burgers with gluten-free buns, the Prime Rib, the fries and a whole lot more on their wonderful gluten-free menu that satisfies even my picky little eater. I had no idea they had gluten-free selections! There is no separate gluten-free menu, but the gluten-free items are clearly marked. From omelets to grits to ” moon dusted potatoes” my son eats worry free here. And so do we! So if you were worried about eating gluten free in Atlanta DON’T!! Just get out there and eat! What are some of your favorites? Let me know in the comments.